CCS was a pioneer in 1991 when we realized that laser cartridges should be recycled instead of being dumped into a landfill. The first laser printer was brought to market, and CCS was born. Our radical vision of manufacturing a high quality, cost effective print solution while being a good steward of the environment was years ahead of the industry and the environmental conscientiousness. With integrity as the CCS cornerstone, the CCS brand toner cartridge was developed to ensure a clean, crisp print with a higher volume page print. Our solid vision and values along with our time-tested business model are, more than ever, a competitive advantage as our industry evolves and consolidates. Our world, our industry and our company have changed significantly since 1991. Our cutting-edge Research and Development Department has created a unique non-destructive process which enhances cartridge performance. We don�t just remanufacture cartridges, we renew, replenish, recycle, redevelop, and retest (boy do we retest) them resulting in a re-engineered cartridge. The result? CCS clients consistently report better quality and higher yields than the competition (which often includes OEMs). 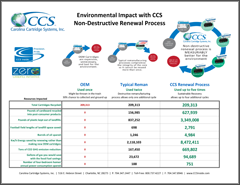 Unusual for our industry, the most recent market survey revealed that CCS clients considered CCS Quality and Customer Service as the deciding factors in their using CCS. Cost savings ranked third and is considered an added benefit. Zero Waste: Keeping �stuff� out of the landfills fills us with pride and true purpose. Helping customers do the same fills us with a sense of empowerment that is rewarding, valued and makes a difference each and every day. Most important, it is making a powerful difference for our world and communities tomorrow. Environmental Impact: We pride ourselves with being the best choice when it comes to Quality, Service, and especially Environmental. We are truly, Savings Without Sacrifice. 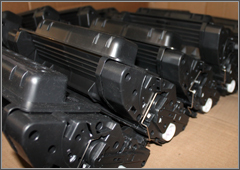 Not only do you get a true OEM-Alternative for your Laser Printer Toner Cartridge, but we are better for the environment than either OEM or Common Remanufactured cartridge. Through our proprietary manufacturing process, we can renew each cartridges up to four times, giving you four times the environmental impact than even typical remans. Click here to see how quickly that adds up! 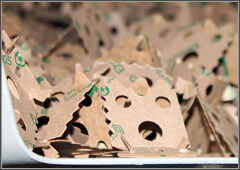 Packaging, cardboard, inserts, foil bags, and plastics are sorted, collected, and recycled appropriately within the plant or through local and regional agencies. 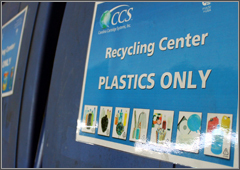 CCS�s in-plant Recycling Center properly collects, segments and stores recyclables for scheduled pick-up by various agencies. Paper, cans, packaging and bottles in the office are collected, sorted and recycled through local and regional agencies. Management has offered expertise, training, and leadership within sustainability manufacturing and green councils and organizations. Tonnage on all waste materials is monitored and tracked for a continuous reduction focus. Careful selection of suppliers, partners, packaging and processes that demonstrate likeminded commitment to preserving and protecting environment. 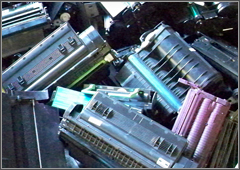 Empty cartridges are sorted for renewal, re-engineering, or resale. Reusable components are reconditioned and restored to CCS�s strict performance standards and reused in production. Unused components are resold to responsible manufacturers. 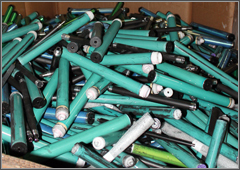 If cartridges are damaged beyond reasonable use, they are sent directly into their end-of-life (EOL) processes for the least environmental impact, ideally reprocessed into other products or converted to energy. One of our leading partners has some great Environmental tips and calculators available here.